Buy 1 for $33.99Buy 2 / Save $1.81!Buy 3 / Save $6.80! 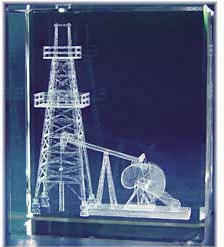 Size (inches): 2.36" X 1.57" X 2.76"
The Oil Tower Motif in Glass is an elegant addition to any home or office. The most modern laser technology produces amazing optical effects under the mirror smooth surfaces of optical glass. In each of the Contento collections glass cubes, a 3-dimensional motif has been carefully worked in. To create the motifs, 3-dimensional models are designed by modern CAD-drawing programs. These models are converted into clouds of points. Each of these points is a co-ordinate for the laser which is targeted by the laser beam. Small micro-cracks form in the glass and collectively build the 3-dimensional image. Depending on the size, up to 70,000 single points may be used to form a motif.